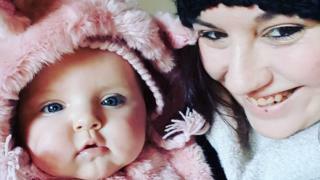 A British parenting blogger has said she has been denied working tax credits because she is unable to prove her working hours. Katie Davis, of Dorset, said she had been turned down despite submitting more than 100 documents, including bank statements, contracts and invoices. She said maintaining her website and social media took hours, but she worked around looking after her baby daughter. Working regular hours is essential for claiming the benefit, HMRC states. The government department has been contacted for comment. As a single parent, Ms Davis has to work for at least 16 hours per week to be eligible for working tax credits, which are worth up to £2,010 per year, according to its website. Self-employed people who do not work regularly are not able to apply, the site adds. "I am working far more than that, but it's not permanently paid work - it's maintaining my own site," she told the BBC. "Sourcing photos, editing, scheduling - often writing the piece is the shortest amount of work." In a blog post, she wrote she often started work at 06:00 and worked until 01:00, both with her daughter and when the child was asleep. Daily work involved promotions, photography, social media management, running competitions and writing product reviews for clients, Ms Davis said. She also spent time reading and commenting on other blog posts across social media in order to drive traffic to her own. Since launching her blog, Mummy In A Tutu, 10 months ago, Ms Davis has worked with brands including Disney Interactive and Warner Brothers but remains self-employed. "I'm just getting to point where people want to work with me, I'm not pounding the pavement to find them," she said. "If I've had a good week, I can switch the computer off at 23:00 instead of 01:00. "Most bloggers don't earn in their first year." Image caption Accessing tax credits was also an issue for actors, one expert said. The issue was not limited to the technology sector, Will Hadwen, benefits adviser at the charity Working Families, told the BBC. "It's not really about the hours themselves being official - the problem is to get around what the law says, which is you have to be doing something that generates a profit," he said. "This is an argument we have been having with HMRC [HM Revenue & Customs] for some time. "It also affects actors, they spend a lot of time doing things that aren't necessarily work, such as spending time on their appearance, but which they hope will get them work. "Katie is getting work, and she can prove her income. "She can now ask for a mandatory reconsideration, and if that isn't successful, she can appeal, and I would expect her to win at a social security tribunal. "It's not necessarily easy - I would recommend she gets advice from the Citizens' Advice Bureau, but the actual cost is free." Serial entrepreneur Emma Sinclair said she was sympathetic but there was a reason for the current rules. "The structure of the government's working tax credits scheme reflects the traditional compensation of hourly rates that many people count on," she said. "That isn't the way many of us earn a living these days - nor do hourly rates necessarily reflect the time we commit to the careers we are pursuing. "That being said, HMRC needs to have sensible, easy-to-define structures in place, such as those for WTCs. "It's impossible for it to cater to every scenario - so while I truly sympathise with the blogger in question, the system is designed to support people on hourly rates. "That's one of the reasons why the entrepreneurial path is so challenging: time spent rarely reflects income accrued on a day to day basis. "That being said, I do think the government needs to think about the changing way that people work these days." Motherhood Challenge: Smug, insensitive or a bit of fun?